It was beautiful weather this weekend, but Limbo is yet to have an outing. I'm making progress though; the new water pipes, filter and pump are in (tastes pretty good so far), the engine has a new impeller and started first time, and the decks are scrubbed. I've given the cockpit's teak grating a good clean (oxalic acid brought the colour back), glued a broken piece of the cap rail (Gorilla glue - seems to work..) and even got round to scraping off the remnants of a Poole harbour dues sticker I unwisely attached to one of the windows a couple of years ago (white spirit). Limbo is a Samphire 26, which - unless you have a particularly deep and perhaps slightly worrying knowledge of older yacht designs - will mean very little. 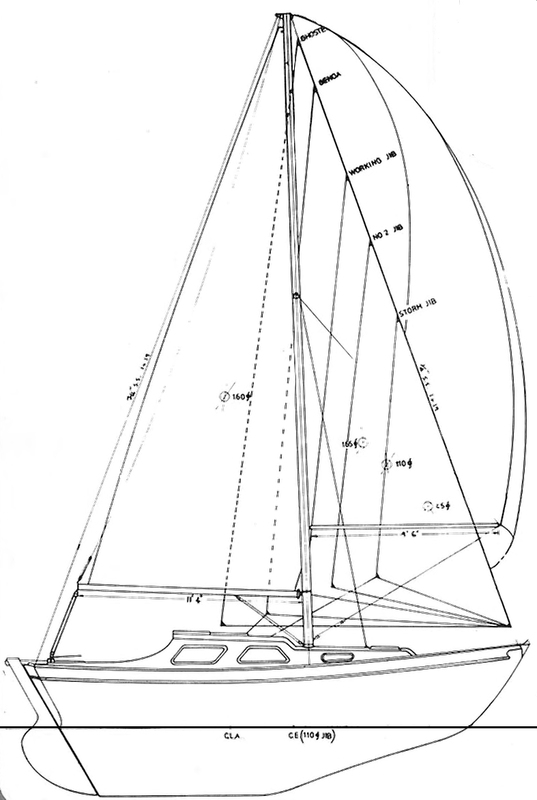 I knew I wanted a boat with a long keel, of traditional design and fairly heavy displacement: for strength, directional stability, and an easy motion at sea. She had to look right too. I saw Limbo listed in Yachting Monthly. Here, it seemed, was a compact but rugged cruiser, with more room inside than otherwise very appealing alternatives (I'm thinking of Contessas, Invictas, Cutlasses and Halycons here). She looked good too - not elegant or streamlined, but tough and seamanlike and well-proportioned. 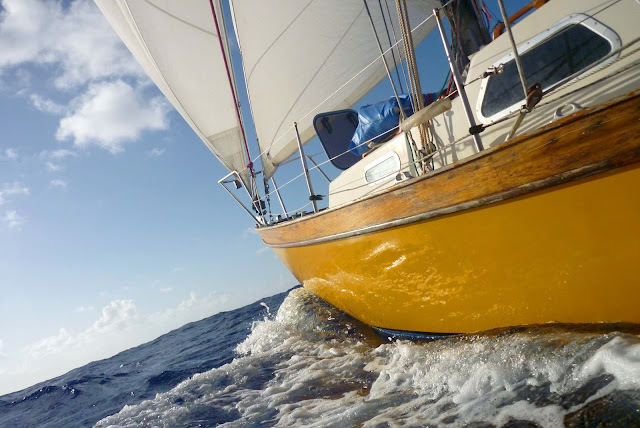 Rather like a smaller Vancouver 27 in many respects, a boat I've always admired but couldn't afford. There wasn't much information out there, but I found only encouraging things: references to a 'proper little ship', and a review noting Samphires 'looked and were powerful seaboats, and proved capable of long passages'. Limbo herself was in pretty good condition. An epoxy-treated hull to stave off osmosis and a reasonably recent engine and electrics were bonuses. The surveyor's report came through and concluded, approvingly, that she was a 'fine little yacht'. I was sold (and so was she). Limbo is back in the water, looking a bit grubby after a long, cold winter on the hard. I went down to check on her at the weekend, planning to give her a good clean, but I got sidetracked by investigating the water tank under the cabin floor. The water was smelly and undrinkable last season and I've been meaning to sort it out for a while. The floor was quite easy to remove, with just a couple of screws, but getting the tank out through a small gap in the beams was tricky - it's not that flexible any more. I scraped a chunk of skin off my hand in the process. Blood and swearing. Last time I was on the boat I managed to crush part of a fingernail; so that's two scars from the season even before getting out on the water.. Eventually I was rewarded with a lovely beige, bilge-oil-smeared sausage of aged water tank sitting on the pontoon. Funny how that was so satisfying. After many sloshings around with hot water from the bath tap at home, the addition of some baking powder and an overnight application of Puriclean, the water looks almost drinkable. The stuff that came out at first was frankly disturbing. I'm going to change the pipes, fit a decent foot pump and add an in-line charcoal filter (£20 or so), which will hopefully result in the untold luxury of drinking water straight from the tap this year. There's no shortage of little and not-so-little improvements to fit in soon, but the priority is to get Limbo out sailing again before too long. She still needs that bath though.